Let me begin with I love Kate Winselt, not ever since Titanic, but since Finding Neverland, so I had to watch this film. 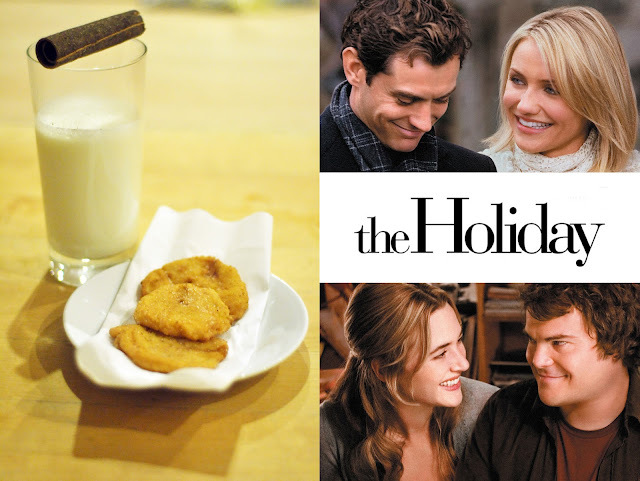 It is a warm and lovely film, best paired with a warm and lovely dessert during a winter night. I was delighted by the outcome of the film, it wasn't the very typical romantic comedies, but it still had those stereotypical elements of romantic comedy entwined in it. The two characters are totally different from one another and both seeking two different things about men...One wanting to get away from them, after a terrible brake up, and the other one feeling rather sad and lonely after an unrequited love. Whats the solution to that? Going on a holiday or just simply locking yourself in at home, and thats what both characters do! The wealthy Amanda (played by Cameron Diaz, who I'm not so fond of...) decides to go to a village in Surrey/England for a break, an unusual place to chose for a break, and its best for you to find out why. This is where the home exchange happens and this is where all the twists and turns in the film happens. I only loved one side of the story, which was Iris' side played by the lovely Kate. Her side was rather warm, thoughtful and heartfelt. She spends some time with an old man in Los Angeles, where she gets to bond with him,enjoy dinner and long walks. Of course that is not the romantic relationship at all, its just a great friendship. Her romance is with Miles (Jack Black) and Jude Law's character; Graham, on the other hand...well well, I couldn't help but drool over his looks! Isn't he just handsome? Graham of course isn't just the handsome and shallow guy, there is so much more to him, which at again added a good twist to the film. Because the night was so cold, and half of the film was based in a cold village, I had to have a nice and warm dessert with it...You may have notice my love for apples, this time it's in batter, fried and sprinkled with a cinnamon and vanilla sugar mix. The batter is simple, all you require are eggs, milk and flour. If you want some taste in it, add a little bit of vanilla sugar. The thickness of batter is up to you, but I recommend it thick, for rich goodness! Mix all ingredients and make sure there are no clumps. Peel the apple skin and cut it in thick rounds. Add the apples in the battered mix and fry them. Once that's done, sprinkle cinnamon powder and vanilla sugar. For extra comfort and cosiness during a winter night, have it with hot milk, put a cinnamon stick on top of the glass for aroma. The Holiday is one of my favorite romantic comedies! And indeed, The Holiday is just an awesome movie. Thanks for sharing, Zinah! I have a sweet tooth and I'm always looking for new recipes. The pictures and the recipe are great! Marium, thank you dear, haha I have a sweet tooth too, can't stay away from desserts and sweets!